This detailed itinerary for the solo traveler in Croatia emphasizes how to explore the country on a budget. Resting on the Mediterranean Sea with a foot lodged into Eastern Europe, Croatia represents a melting pot of culture, cuisine, and natural scenery. Traveling through this small country allows one to explore gorgeous national parks, wander through cobblestone city streets, and lose track of time on warm, sandy beaches. In a country with so much to offer, how does a solo traveler efficiently see it all? 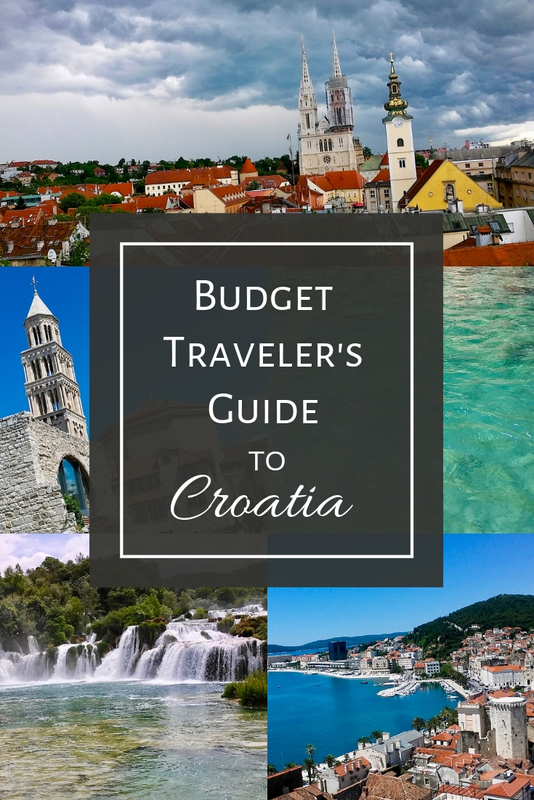 More importantly, how does a traveler make the most of Croatia while sticking to a backpacker’s budget? Here is a rough guide of how to tour through this beautiful country, while saving money and still indulging in all of Croatia’s wonders. Osijek represents the largest city in Croatia’s eastern Slavonia region. Visit this cultural and economic hub to try some hearty Eastern European cuisine, relax in the grassy public parks, and people-watch in the public squares. Reaching the city center from the tiny airport is easy: just hop in one of the public vans that carpool people for much cheaper than a taxi. Asking locals for directions on how to do this is very easy as many airport employees speak English and people are generally quite friendly. Don’t forget to download a few travel apps that might save your life once you’re there. Hostel Tufna is small but cozy, located a short walk from the main bus station, and costs less than 20€ a night. Take a walk down European Avenue, a spacious boulevard framed with magnificent and archaic architecture. Visit the train station in Osijek to buy a 19€ ticket for a 4-hour train ride to Zagreb, the charismatic capital of Croatia. Wander through the city’s historical center, also known as “Gornji Grad”, where you can find interesting museums, traditional restaurants and towering cathedrals. Definitely stop in the Museum of Broken Relationships, where they showcase unique stories and memorabilia from breakups all over the world. Chillout Hostel has dorm rooms for as low as 12€ a night and has a nice social common area for meeting people and watching live music. It is also conveniently located right at the bottom of the hill which leads to Gornji Grad and is a 20-minute walk from the train and bus station. To help you save even more money on your trip, you can exchange work for accommodation in some of the best hostels in Zagreb. Dolac Market, a bustling farmer’s market hosted every morning near the main square known as Ban Jelačić. Here you can find everything from crisp woodwork, to fresh produce, to overflowing bags of dried fruits, all for incredibly cheap prices. A bus ticket from Zagreb to this world famous National Park costs only 10€, and the journey is only a couple hours so it’s the perfect day trip from the Zagreb. The admission ticket to the park varies depending on season, but average is around 15€ (cheaper with a student discount). But there is no better way to spend your money than visiting this UNESCO World Heritage Site, as the stunning natural scenery and powerful waterfalls are sure to leave you breathless. After enjoying city life in Zagreb, it’s time to venture down the Dalmatian Coast and breathe in the ocean air. A train from Zagreb to Split costs about 20€ and the 6-hour ride brings you through the vast green hills of the Croatian countryside. The small city of Split is full of whitewashed historical buildings, busy vintage markets, and lazy beaches where the bright blue ocean gently caresses the white sand day in and day out. Split Guesthouse & Hostel may be the friendliest hostel in all of Europe. Centrally located and budget-friendly, this family-run guesthouse feels more like a home than a hostel, where grandma cooks homemade breakfast and all the guests become instant friends. Climb the St. Domnius Clock Tower for the most amazing view of the oceanside landscape. For an outdoorsy adventure, stroll through the peaceful forest at Marjan Park and watch the saturated Mediterranean sunset by the water. If you still have room for more breathtaking waterfalls and dense forest paths after Plitvice, visit Croatia’s second most famous national park. Krka National Park is a short walk from the town of Skradin, where you can get a round-trip bus ticket to and from Split for 18€. Depending on the season, tickets for the park can vary from 4€ to 24€, but the ability to swim in the crystal clear waterfalls makes the trip worthwhile. After purchasing a 15€ bus ticket, you can enjoy the dramatic views of towering cliffs and sparkling ocean along the Dalmatian Coast while driving south towards Dubrovnik. Upon reaching the Dubrovnik, head straight for the Old Town to walk through the narrow, steep alleyways and enjoy the wide array of nice restaurants. My Way Hostel Dubrovnik is conveniently located within walking distance of the main bus station and the Old Town, and costs only 17€ a night for a mixed dorm room. You can also stay in the city as a worldpacker, exchanging your skills for accommodation and living with locals to fully live the Croatian culture. Walk along the famous, towering city walls that wrap around Dubrovnik’s Old Town to witness sweeping views and get a nice workout. The regular price entry fee is around 20€, but with a student card, it only costs 6€. No trip to Croatia is complete without visiting one of its many islands, and Dubrovnik is a great base for venturing out into the Adriatic Sea. In Dubrovnik’s main harbor, small boats leave every half hour for Lokrum Island, and the 15 minutes ride costs only 5€. Upon reaching the island, spend an afternoon hiking in the peaceful forest, swimming in the refreshing ocean, and mingling with the local peacocks. Visit Dubrovnik’s main bus station to catch a cheap public airport bus. The ride is only 30 minutes, costs 5€, and tickets can be bought at the bus station. Though this itinerary does not include every captivating city or beautiful beach in Croatia, it provides a rough outline of how to explore different areas of the country with limited time and money. You can definitely explore some of the best places in Croatia on a budget and this trip can be done in under two weeks, with about 3 or 4 days spent in each city. Between the national parks, the scenic train rides, the coastal towns, and the landlocked metropolises, Croatia overflows with natural wonders and man-made expressions of creativity, history, and culture. This trip allows you to catch a glimpse of it all.